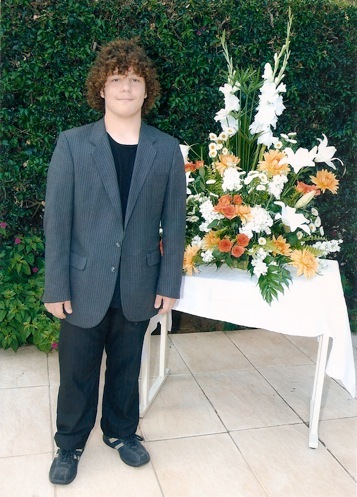 The day after school got out, Elliot went to his first ball. It was, of course, simply an end-of-the-school-year dance, but the name in French amused me greatly. “Your first ball,” I kept teasing him and tried to get him to waltz with me down the hall. He nearly missed it because I didn’t read the invitation closely enough. There was a deadline for the response. When I realized we were too late, I told him to go talk to the CPE. “Explain it was my fault,” I urged. You can get away with quite a lot when you’re foreign. And sure enough, the CPE agreed. “But don’t tell anyone,” he instructed Elliot. “I don’t want a lot of other kids coming and saying I have to make an exception for them as well.” The result was that Elliot didn’t tell any of his friends he was coming, so we had no idea what anyone else was wearing. In the afternoon he shaved. The ball started at 7:30 and went till 12:30, so we fed him early and sent him off. He told us later that he was among the better-dressed of the boys, but the girls were all in party dresses and sparkly high heels. The music was so loud that we could stand on our balcony and hear the words of the songs being played. They played the World Cup song at about midnight and everyone cheered and waved flags. 5 hours of dancing to techno beat, hanging out with his friends, eating sandwiches, buying Cokes, talking to teachers. He came home elated and exhausted both, glad he went after all. 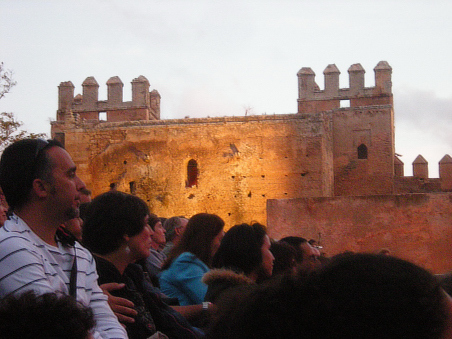 Continuing our new tradition of going to the last night of concert events in Rabat, we managed to make to the final evening of the Jazz au Chellah series. Long time readers (mythical creatures that exist only in my mind) will remember that I have mentioned the Chellah several times before. 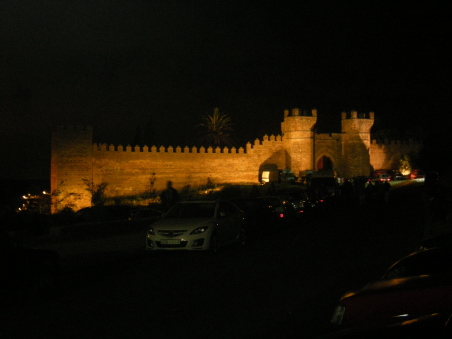 These ancient Roman and Moroccan ruins surrounded by a medieval wall are a popular spot to visit, and when we saw the posters advertising the event we knew instantly that they would be a perfect venue for an open-air jazz concert. Then we promptly forgot. Fortunately Shannon, my personal event coordinator, was on hand to call and remind me. I, unusually, had to work till 8—the time the concert started. I’d just rushed my class out and gotten in the car when Shannon called. “I’m saving seats but it’s getting ugly,” she warned me. “They have seats? Cool!” I replied. I flew—that is, I drove sensibly and carefully—across town, picked up my family who were waiting for me, and hightailed it over to the Chellah. Parking was adventurous. The kids spotted several of their teachers’ cars, which didn’t surprise me, since apparently all of Rabat had driven to this very spot at the same time. Once inside the Chellah, walking along a path strung with twinkle lights, it became apparent where all the occupants of all those cars were now. Every single seat was taken, plus every available inch in the aisles and on the steps. The carpets laid between the bleachers and the stage were crammed with bodies. It was a fire marshal’s worse nightmare. We actually did manage to spot Shannon and her son, and we waved cheerfully. Then, we found a spot at the edge of the carpets, and settled down to enjoy the jazz. The first concert was a Finnish group, Ilmiliekki Quartet, and they were fine. This is a snippet so I’m not going to get into details. The twins kept insisting that they had “very good views” and borrowing my camera to take blurry photographs. At the break, Ilsa and I managed to make our way up to sit by Shannon, thanks to her son going down to the carpets to hang out with Elliot, who had been brought to the concert by force. 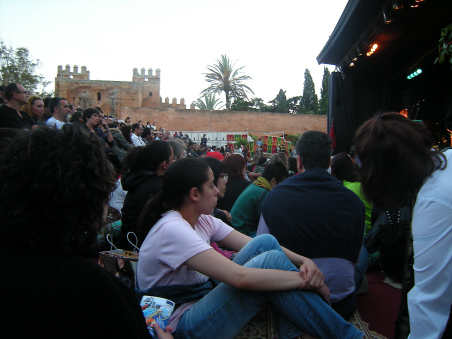 (He took some pains to make sure I understood that he did not like jazz and wanted to go to a café and watch a soccer match, but we insisted that the experience of an open-air concert in ruins that are millennia old was not to be missed). As I was squeezing my way down the row, past others who cheerfully made way for me, I managed to bang a woman in front in the side of the head with my purse. I apologized profusely but she was not to be mollified, pulling a face and muttering about “americaines” to her companion. Shannon, shaking with laughter, told me she’d done the same thing earlier, then her son had kicked their chairs accidentally (he’s tall), plus they’d been extremely irritated with her for trying to save seats. 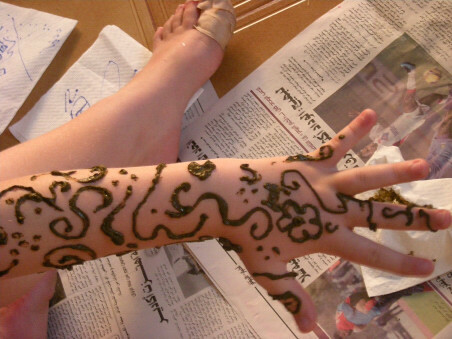 “They talked about me in Arabic for at least 10 minutes,” she said. We saw several friends, teachers or kids from my kids’ school, and waved at them. It was beginning to get dark by this point. 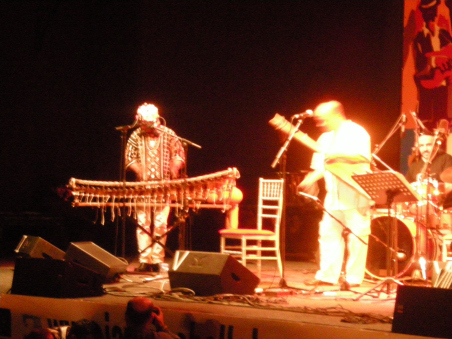 Finally the second group came out; a combination European jazz trio and a gnaoua group—which is kind of worldbeat, quasi-religious music originally from Morocco, Mali, and West Africa in general. The set up included two complete drum sets and a xylophone made of gourds, as well as spaces for guitar and saxophone and singers. 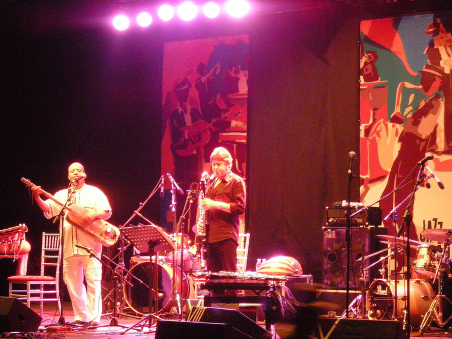 Initially, it was a trio—drummer Ramon Lopez and saxophonist Louis Sclavis , as well as Majid Bekkas, who sang and played the sintar. A diversion arrived in the form of some attention-starved young men. One, dubbed “Morocco Man” by my family, was wearing a red unitard with a green “S” on the chest and green undies. His hair was a red Mohawk and his cape was a Moroccan flag (red with green star outlined in center). His friend was high on something more than life, I sensed. He had long floaty hair. Together they danced enthusiastically at the edge of the stage. It was funny to watch people’s reactions. On the one hand, many people were simply entertained. On the other, the dynamic duo were definitely the focus of a lot of attention, and you could see that the saxophonist in particular wasn’t too happy about it, although he kept that tight-lipped “hey I’m cool” smile going. The dancers tried to pull everyone into their happy skippy dance, and got yelled at for their pains. But the TV crews filmed them, and I could see why the musicians were less than thrilled. 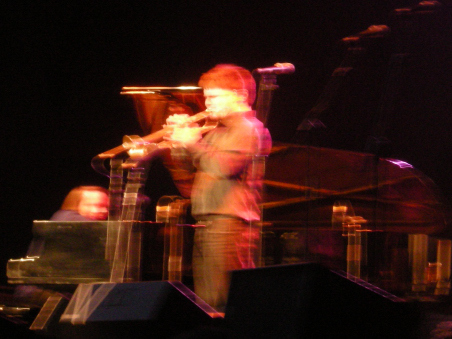 Why yes, my blog would look much better if I always used Donn’s pics. But I don’t, because I keep finding copies of my blog posts on other sites, which annoys me no end. It’s not fair to subject him to that. Later, 2 more singers/chanters came out, dressed in traditional multi-coloured outfits, clanking their krakebs rhythmically, and a young man with an enormous smile appeared to play the gourd-xylophone, which had a very sweet sound. A second European drummer appeared, and enjoyed getting the crowd involved. It was a very enthusiastic audience. Majid Bekkas started playing a thumb-piano, which I found fascinating. Donn wanted one of those for years and I was never very sympathetic (although rather that than a dijeridoo), but I found the plunking of the thumb piano to be very melodic and pleasant. Later Bekkas switched to an oud, the sound rich in the mellow dusk. The saxophonist proved to be adept at clarinet and trumpet as well, and the two drummers and the singers added rhythm and harmony to the warm summer night. Gnaoua music is not our favorite. It’s awfully repetitive, for a start. We were glad we’d come and it was worth seeing, but it was also now after 11 on a school night, and plus we wanted to beat the crowd. So we left early. Ilsa bought herself a very cool black “Jazz au Chellah” tshirt for $3.50, which she now wears with black leggings and bead necklaces, looking freakily like I looked in the late 80s. Seriously. Same hairstyle, same penchant for wearing one long dangly earring and one small stud. We found our car and took a look back at the Chellah lit up for the night. It was gorgeous. We wish we’d made it to more of the concerts, but that’s life. There are many things going on in my life right now, that I will bore you with tell you all about sometime, and I haven’t been posting. 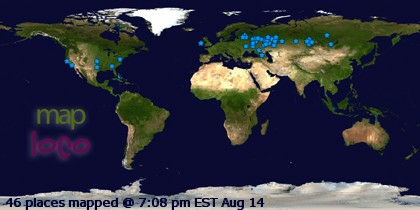 In the meantime, I’m going to do several short posts on some of the highlights of the past few weeks. 8 days ago now, the kids got out of school for the summer. (They get out early because they attend a collége, which is middle school in the French system, with the equivalents of Grades 6, 7, 8 and 9. In order to advance to lycée or high school, students are required to take a week-long exam called the brevet at the end of Grade 9. The 9th-graders are given a week to review, and then of course a week to take the exam, so school ends mid-June for the 6th, 7th, and 8th graders. Was this too much information for a summer afternoon? Sorry) Donn and I happened to be coming home right as school finished that last day, and we heard a mighty cheer go up! It was pretty fun. 10 minutes later our kids burst in the door, faces flushed with excitement, to tell me about the all-school party that had occupied their afternoon. Ilsa had taken in a plain white t-shirt and had it signed by most of her classmates and teachers, as well as the principal and vice-principal. Ilsa prepared for her last day with great aplomb. 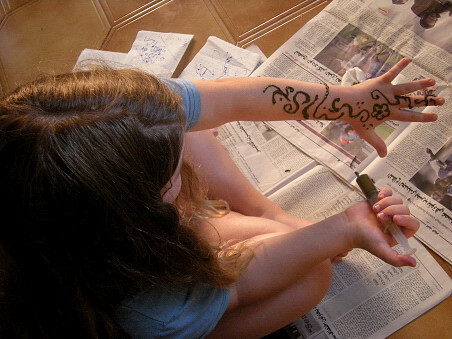 She and I have had plenty of hennas done in our time, but for the first time, she decided to do it herself! 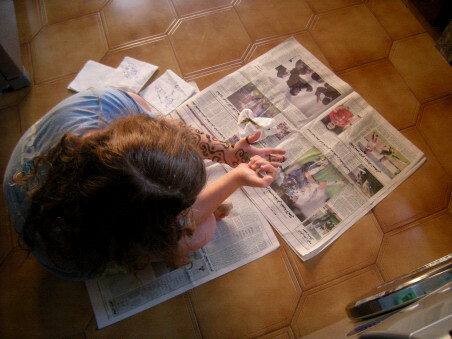 We mixed henna with water to form a paste and she squirted it out of an empty syringe to make patterns up her left arm and on her ankles (and mine!). 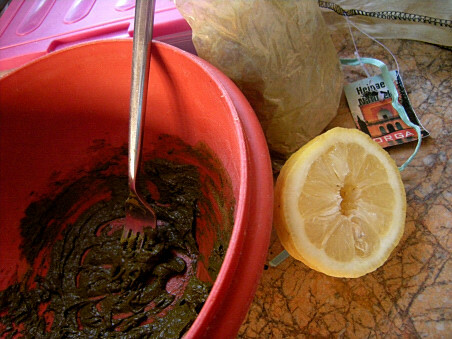 Then we put lemon juice on to help it set well. a man riding a motorcycle sidesaddle. This was afterwards, while we were getting a pouf stuffed. a man taking a lighter and applying it to a pair of sandals I was considering. He wanted to show me that it was real leather, but I didn’t want to flame a new pair of sandals, especially since they were the only pair he had in my size. 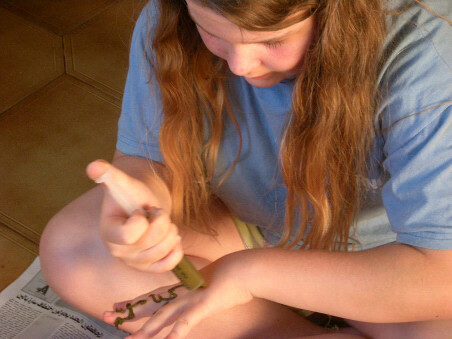 then, to show me that the sole was “real rubber” and therefore comfortable, he twisted the sandal into a corkscrew. Oddly, that did not make me more inclined to buy. 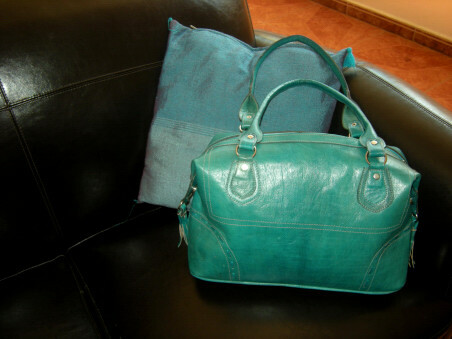 I have been needing a new purse for a while, and I fell in love with this turquoise model. I don’t think, in all the years I’ve been carrying a purse, I’ve ever owned one that wasn’t black, brown or grey. Well, maybe in the 80s I had a white one. So this is a real break with tradition. What do you think? Too bold? Too limiting? Or just fun? 6. we had large glasses of fresh-squeezed orange juice for about 60 cents each. They were delicious. The glasses and oranges were washed in the same tub of water, but I feel it adds a certain je ne sais quoi to the taste! Just kidding. The juice is fantastic, and studies have proven a certain amount of ingested microbes only strengthen your immune system. 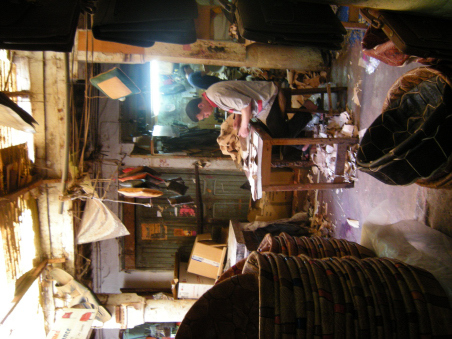 7. men sewing poufs. 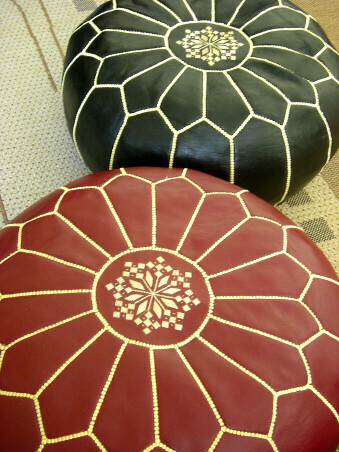 Moroccan leather poufs are famous. 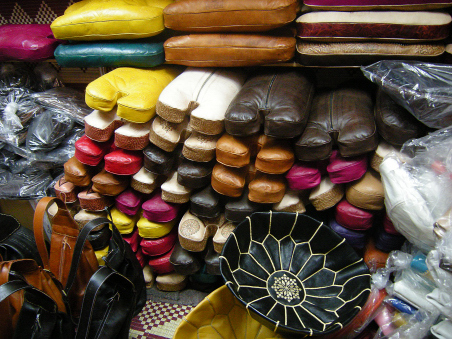 Named for the little noise, the pouf, they make as you sit down on them, they are fantastic examples of handicraft, and come in a staggering array of colours, shapes, and sizes. New since our last visit—gold ones! For the Liberaces among us! 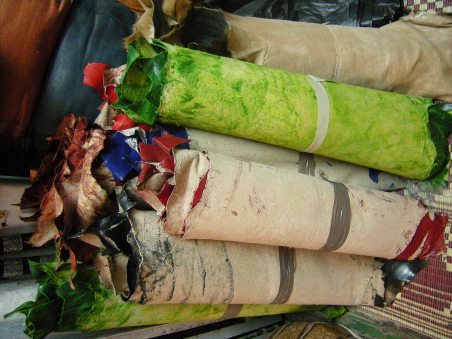 This is what they start with–brightly-dyed leather roll-ups. They smelled like they were goat to me. 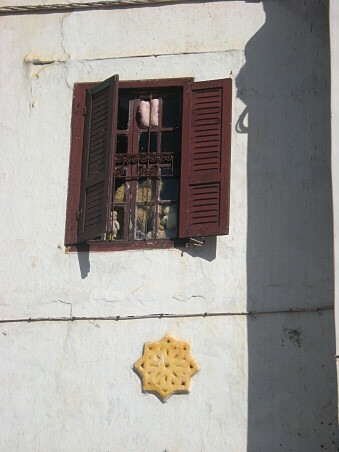 8. this window was near where we had the pouf stuffed. I don’t know how well you can see it, but it’s filled with random bits of stuffing and two or three stuffed teddy bears, stuck right down in the corners, as if they are looking out and contemplating their own origins. I feel it is a very existential window treatment.